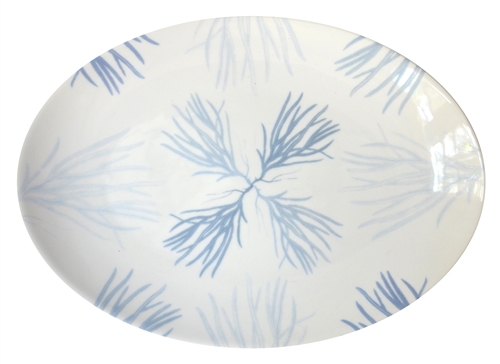 Adorned with our Flora pattern, this medium coupe serving platter is a wonderful addition to any table or buffet and also makes for a special gift for the sea lover in your life. Perfect in size for large and small gatherings, this soft, botanical patterned platter will become a house favorite. Vintage botanical engravings are printed in soft, oceanic tones. Hand-decorated. Dishwasher and microwave safe. Made in America exclusively for Nourish™. Measuring 12.5 inches x 9 inches. Add our Flora Large Serving Bowl for a coordinated look. Fine, hand-decorated porcelain made in America exclusively for Nourish™ • 12.5 in. x 9 in. 12.5 in. x 9 in., hand-decorated and made in America exclusively for Nourish™, lead and cadmium free, fully vitrified.